Hang this brass Chinese knots in your home, office or business. Choose from the Phoenix or Dragon. 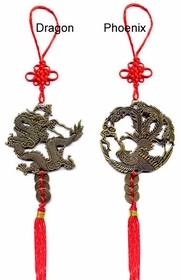 The Chinese knots measures 12" long including tassel. Suggested Uses: Auto Mirror Hanging, Lamp Hanging or Door Hanging. Group Hangings can also be very attractive.